CFA Vs CFP Vs CWM: Which is Best for You? Finance Certifications » CFA Course » CWM Vs. CFP Vs. CFA: Which One Should You Go for? CWM Vs. CFP Vs. CFA: Which One Should You Go for? Let us clear it out. This article will be a comparison between Chartered Wealth Manager (CWM), Certified Financial Planner (CFP) and Chartered Financial Analyst (CFA) professions. We will be going through a brief on these professions, how to get these degrees / certification and how to gain professional leverage with them. How to get CWM Certification? How to become a CFP? How to Become a CFA? CWM finance certification is awarded by the American Academy of Financial Management based in the United States. It is a certifying council which grants other certificates also, such as Chartered Asset Manager (CAM), Chartered Market Analyst (CMA), Chartered Portfolio Manager (CPM), Master Financial Professional (MFP) and Chartered Trust and Estate Planner (CTEP). This certification lets you concentrate on capital and financial markets theory, financial services organisation principles, portfolio management, investment management and other professional additions. The completion of CWM ensures that you will be able to fulfill certain financial management capabilities such as assessing the value of listed companies, perform financial estate analysis, understand portfolio management time horizon, balance risk and returns, identify market opportunities, market products, handle asset allocation and manage clients. Can everyone do CWM course? You have to clear both Level I and Level II examinations. The enrollment happens through the AAFM website and the exam scheduling is done by Pearson Vue. A certain charge is applicable. To become eligible, you should have 3 years of relevant working experience and a qualifying Graduate degree which could be Masters in Finance, Economics, Tax and Wealth Management from ACBSP accredited Double Business School, ABA accredited Law School, EFMD EQUIS accredited Double Business School and some other verified accreditations you can see here. Actually passing the CWM will be a significant addition to your career goals. You can continue working in the current company, join any other or become a self employed professional. Either way, you need to leverage the full potential of the CWM certification. Begin by making the certification visible. By that, we mean adding the CWM® in business cards, cover letters, after your name, website, corporate photo ID, publications, name plates, badges and others. Inform the HR or the CEO of the new credential, announce it within your professional network through mediums like LinkedIn, wear the CWM® pin in industry events, display certificate in office and you can also become a mentor. CFP is a financial certification requisite for those interested to enhance their financial planning careers. Within the United States, the certificate is conferred by the Certified Financial Planner Board of Standards and outside the United States, the same is conferred by the 25 organisations associated with Financial Planning Standards Board. If you already have approved CFP designations like Chartered Accountants (CA), Chartered Certified Accountants (ACCA), Certified Public Accountants (CPA), Chartered Wealth Managers (AAFM), Chartered Financial Consultants (ChFC), Chartered Life Underwriters (CLU), Chartered Financial Analysts (CFA) and attorneys, you can directly enrol for the CFP exam. As mentioned, if you already have the designations listed above, sit for the exam directly. If not, you need to follow certain educational, ethical and experience requirements. First, you need to have a relevant Bachelor’s degree or higher in any one discipline from an accredited institution. Once the CFP Certification Examination is cleared, you have to provide a transcript from the institution as a proof of your degree. Second, you can complete a Board sanctioned Education Program from affiliated colleges and universities. These programs contain both the credit and non-credit certificates and these can be attempted through online instruction, classroom instruction or self-study, whichever suits you amicably. It’s an exhaustive exam; spread over 2 days, 10 hours and zillions of multiple choice questions, it’s not an exam to be taken lightly. The exams happen thrice a year in March, July and November in various registered locations. A certain fee is attached to every exam. If you’re not good at self-study, you should take professional exam preparation help. At least 3 years (or, 6000 hours) of experience is necessary, working in the area of financial planning. It could be about preparing financial plans, handling investments, retirement counselling, selling insurance and such. The second requirement measures the nature of your experience which should be one or more of the five ways. Supervision of client delivery, personal client delivery, supporting client delivery, teaching and residency programs / teaching. Once all the requirements are fulfilled, you become a Certified Financial Planner (CFP). How will the CFP certificate help your career? According to the U.S. Bureau of Labor Statistics (BLS) 2013, the average median salary of a CFP is 75,320 USD. With the CFP certificate, you can work with individual clients or handle them within an organisation to manage their long-term and short-term financial goals. You can advise them on legal restrictions, financial laws, estate planning, investments planning, insurance benefits, tax planning and other things. As the financial planner, you need to possess a holistic understanding of client’s business and offer complete financial solutions. The duties would include interviewing clients, preparing financial plans, executing them and monitoring the outcomes. Strong analytical skills and good people communication skills are crucial for this business. Learning to use databases and excellent research skills are mandatory too. You can work as self-employed or be employed by investment companies, insurance companies, banks, loan institutions and other financial companies. Further, there are options like conducting workshops, financial consulting and teaching too. CFA is a globally recognised certificate conferred by the US – based CFA Institute, formerly known as the Association for Investment Management and Research. When you clear the CFA exam, you are known as a “CFA charter holder”. An extremely difficult exam, the exam pass percentage historically is as low as 32%. Candidates who are successful take about four attempts to clear the charter. Of course, you have to clear the exam. To become eligible, a relevant Bachelor’s degree is mandatory. Experience-wise, 4 years of qualified experienced is taken into consideration. You can become a member of the CFA Institute and get membership from the local CFA community. There are three exams of six hours each and you have to clear all the exams. The first exam happens in June or December and the remaining exams happen in June only. It’s like if you fail the second or the third exam, you have wait for an entire year to take the exam again. All the three exams check your knowledge for financial analysis and sense of ethics. The first exam tests the financial concepts basically; the second exam tests financial analysis skills and intensive accounting procedures while the third exam tests portfolio management skills and decision-making potential. Lastly, it is of utmost important that you, the charter holder, maintain the norms and regulations recommended by the CFA Institute Code of Ethics and Standards of Professional Conduct. Once you get the charter, you can begin working for institutional investors as a financial analyst. You can work in the capacity of a Money Manager, Financial Advisor, Portfolio Manager, Financial Risk Analyst, Securities Trader, Investment Banker, Sales Professional, Investment Firm Manager, Chief Investment Officer and Chief Executive Officer. There is a lot of scope for CFA charter holders. According to the Bureau of Labor Statistics, there will be a 23% increase in jobs for Financial Analysts, 15% increase for Commodities Agents and 9% increase for Financial Managers between 2010 and 2020. Of course, you need to have CFA charter to get these positions. Here is a chart highlighting the differences. Any of the courses have the potential to give shape to your career. Choose any of these carefully, understand what direction will they give to your career and should you be pursuing them. If you have any doubts, ask below. I wanted to get into a asset management, portfolio mangers, Money management firms and wanted to work as buy side analyst.Kindly advice me the more apt course for me. Please contact me on WhatsApp for Career Guidance. Kindly advice me which will be the best CFP OR CWM. I am already working in stock market. 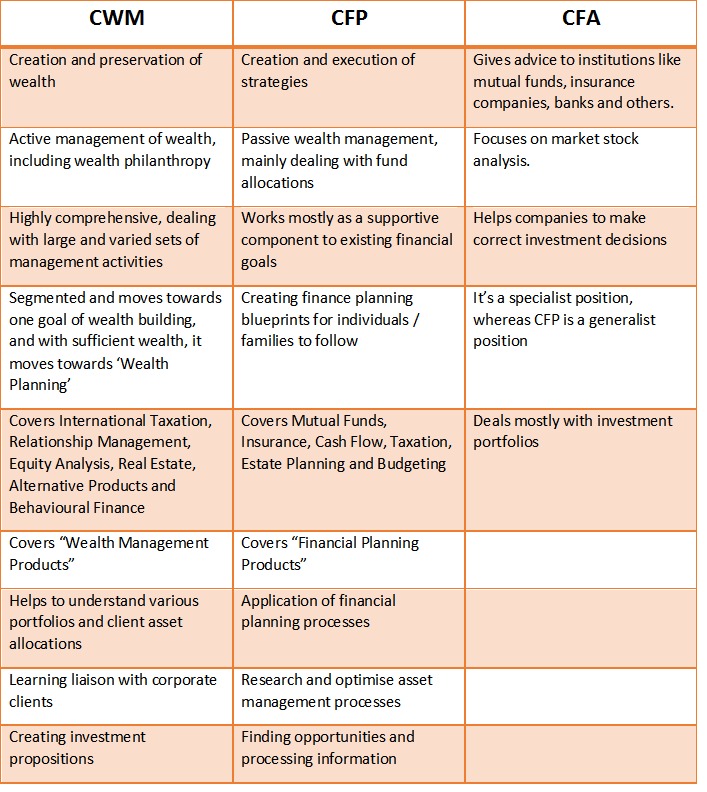 Please check the section: “Difference between CWM, CFP and CFA” in the above article and you will get the answer. What’s your career goal? Is it Personal Finance or Corporate Finance, Equity Research, Financial Modeling? As I’m a computer science graduate , I’m exploring different options and kind of open to learn things in finance. what is the best certificate for me? and what is the best certificate that will raise my salary ?? Which profile in Big Companies are you looking for? Kindly guide which program is suitable for me as I have done MBA in Marketing and Finance with 5.5 years of experience in banking as Relationship Manager ,managing portfolio of loans performing financial analysis of proposals. As I am available online, so kindly also tell that online programs are having equally importance in Building a career In same line. How much time program will take to complete. Please be specific about your career goal and requirements. I can help you select a right course. Thank you for the wonderful insights on all the three. I have experience of 8yrs in Financial Sector both in Banking & Broking House. I have an interest to pursue CFP , will this be the right decision ?currently im working as a wealth manager in one of the banks. Please go for CFP if you are open to working in Business Development and Client Relations for first 1-2 years before moving to actual Financial Planning. For Hedge Fund Analysis, you need these skills. I have cleared CA IPCC and 3 Years of articleship in CA Firm. I am Looking Career in Banking and willing to move abroad to take job. Which Course would you recommend ?. Basically I am looking for Job Oriented Course. Please guide me through the same. CFA/ CFP are internationally recognized certifications and you can move abroad after gaining relevant experience post-certification. Currently working as Branch Manager in a bank. Want to move from retail branch banking to other verticals i.e as an analyst or so..
Pls suggest the best course that I need to do. Please read this post to become a financial analyst. I am working with an AMC. I want to grow ,so plan for doing some financial courses but i am quite confused for CWM/CFP and CFA. What can be a better option? If you want to grow in Asset Management field, then go for CWM/ CFP. I did Mcom and I have 7 years of experience in finance company as a relationship manager.I want to know which course is in more demand , easy to complete and more worthable i.e. CFP / CFA or CWP. I suggest you read this post once again to get your answers. In cwm,cfp which one including problem subjects,and accounting subjects because these two makes me difficult.Theory is not a problem for me. Please check their curriculum and decide for yourself. Both are good certifications. what will be AN average package for cfp? i am very interested in CFA but i can’t bare that much examination fee.show me a way. i am a banker. You can check this course. I m confused between CFP and CWM, I which one is more valuable and broadly recognise by industry. Hi sir I have completed my graduation in B.com but I am confused in these three course will help me to make career growth please let me know?? Please read the article again and you will know. Hello I’m CA inter.so which course will be easy and beneficial for my career. Whether after completing chartered wealth manager course whether jobs are available or the course is in demand which gives secured career. Yes, jobs are available in Banks. I am from mumbai graduated and pursuing my mba from pune..
i have done some courses from BSE & Welingkar apart from my graduation. And am very much interested in the course of CFP but confused between CFP/CWM as i have gone through the article above. is it necessary to do CFP/CWM in USA?? Note# I dont have any experience..!! Yes, majority companies in US/ UK prefer CFPs. Hi , dear sir , i have done MBA in marketing , and also we have 1.6 years in financial services , but now further i am cunfused in cfp , cwm and financial modeling , which one is valuable . Why do you want to join a course? What’s your long-term career goal? It seems you haven’t read the article carefully. Please read it word-by-word and you will get answers to your questions. The value lies in a candidate and not in any course. Job opportunity will be in financial planning. India and abroad. Basic accounting skills are enough to clear CFP, as the course is more about financial plans and communication. Join a program which gives you practical skills. CPA Vs CFA: Which Is Better?